The crux of Bad Luck Inc., all narrated in first person by Neon. The main things to pick out here, is that control, for the employee, is non-existent. Our destinies become the toys of those who hold the contract we sign our names on. Personally, I've been lucky enough to not have to deal too long in jobs I've not liked and obviously I had the power to quit if the need be, something which isn't open to Neon, but I'm sadly aware of the sentiment that so many people out there (some family members included) hate their jobs and are trapped because society traps them to a mode of thinking that they cant change that. And in some realities, that's totally true. Although in this case, we're dealing with an extreme which highlights one of the main themes of the story. Yui did a great layout job on the issue overall, but there's some exceptional positioning on this page in the last three panels where Neon starts to close his eyes and we zoom in. Panel arrangement is really taken for granted when it comes to comics, and bad panels can throw your eyes out and make things very difficult to follow. Here Yui does something subtle but brilliant – she expands the panels with each zoom. 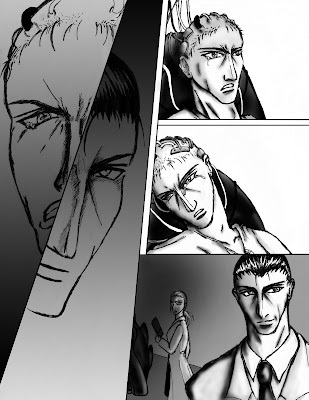 We see Neon lying down in a small panel, then as we get closer to his face the view gets bigger until the final panel and its background fill nearly half the page. As the panels fall, your eyes fall from left to right to read them and the captions (which are very well placed by Brian J. Crowley) – so it's all very natural. The big double page spread as Neon awakens into his new reality. Which is the big story telling faux pas I mentioned a while back – having the bulk of the story be a fabrication. And if there's one thing worse than Bad Luck being similar to The Matrix, it's making over half the story an illusion. Here we see the first appearance of Democritus and the second appearance of Minrep (who was on Page 2, in case you didn’t catch him watching Neon's progress). Minrep's name comes from an abbreviation of a well known sci-fi book and film, while Democritus is based on the pre-Socratic Greek philosopher. As you can probably tell, he's a cyborg – with his eyes being the most telling clue. At the moment they're totally blank, but you'll see that change over the remaining pages. By the way, the line "employees, the have such a weak grasp of the big picture" is something adapted from what I was told several times in my office life. In a less harsh way, but effectively the same thing, all the same. Here we get all the reality of the book to date as Minrep provides exposition for us. The big things on this page being there's a ton of people in the same situation as Neon, all going through various unrealities which are played out on a vid screen. Notice the tattoos they all sport on their collarbones– 6:7 (=13), the same tattoo we see Neon has at the start of the story, marking their entry as experiment subjects. Yui takes credit for that idea, as originally the story only had Neon with the tattoo, but she suggested they all have it as a mark of the experiment, which made perfect sense. Also look at their names, all linked to the number 13: J.C (same initials as Jesus Christ, and thus the last supper), Aluminium (has the atomic number 13), Torah (a Jewish allusion - the teachings of the Torah document state there's 13 attributes of mercy in God) and the final guy who's name was cut off in production was Togo (an allusion to the anime and manga series Golgo 13, where Golgo's pseudonym was "Duke Togo"). More exposition as we enter the final few pages of the story, in discovery of how long Neon has spent strapped to this machine; a long time. Hell of a long time to have your eyes closed to reality, but that's the point of the story. Yui does a great job of showing the two sides of the employment coin, with the half face panels – it's dramatic without losing its meaning. The other big thing on the page here was again made victim of my dialogue being a bit too long – the final panel on the page has a doctor in the background who's looking at Minrep with a look of slight shock as he talks about "sleeper agents", inferring that she may in fact be one and thus leaving us open to the idea there may be hope beneath all this gloom and negativity. Alas, the dialogue is just a tad too much for the panel to hold everything without sacrifice, and so this unspoken bit of narrative had to go, which was a shame. The final page, which portrays the thematic link of the eyes. But before I get into that, something you may not have noticed – the panel arrangements are generally the reverse of that on Page 1. This is to reflect the story restarting again, in a sense, but also reflects the circular nature of the tale, eyes closed to reopen in artifice once more. So, the eye metaphors. Naturally there's the element of Neon's eyes being closed during most of the story in a metaphorical sense. The only time they truly open is when they close, representing the ironic nature of Neon's existence- when they close again, we know that next time they open (when the story restarts), they only open in a very unreal sense. With people in the story showing us closed eyes, bleeding eyes and those which are wide open, you can guess which ones are possibly part of the experiment, which ones are onlookers, and which ones may just be incidental – and don’t forget how the Bad Luck Inc logo eyes trail us throughout too. Democritus' eyes are dice that change in each panel he's in, showing us the theme of determinism in a recognizable form – his eye-dice roll in very intentional ways, which go against the very nature of dice, to show us Neon's fate is indeed locked and predestined. When Democritus' eyes hit two ones (snake-eyes) it's over. Visually, this is meant to also be slightly ironic, as it should be the eeriest depiction of Democritus despite the fact snake-eyes almost give him human looking pupils, which go against his nature and his spoken message, sealing Neon's fate. Throughout the story, eyes are the mirror to the soul that reflect the nature of that person's circumstance, especially regarding the test subjects and Democritus, who's eyes are artificial, reflecting all the above and the fact he's not a 'real' human. Democritus' quotes are taken directly from the Greek philosopher, by the way, who has a large number of memorable quotes – some of which suit the Bad Luck Inc philosophy perfectly, and so became part of "the company handbook" Minrep mentions. And that about wraps it up. This isn't everything to Bad Luck Inc., but a large portion of its subtext and other little bits that make up the most of the story. Hope you've enjoyed both this and the story itself, or at least found reading a little of the process and background behind it all of some interest. Next week I'll go back to my usual less focused ramblings, as several big projects loom ominously around the corner… although I'm not certain I can talk much about them yet. Typical. Gosh, if that's how much underlying meaning you have behind a short story, I wouldn't like to ask about a novel, lol! Hope all is well with you and you are keeping up with work ok!